Brown sausage with mushrooms and peppers in large nonstick skillet on medium-high heat. Drain; return to skillet. Add cream cheese spread, mozzarella and garlic powder; mix well. Remove from heat; cool 10 min. Unroll pizza dough on clean work surface. Pat out to 15x11-inch rectangle; cut lengthwise in half, then cut each piece crosswise into thirds. Top dough rectangles with sausage mixture; fold in half. Seal edges with fork. Place on baking sheet sprayed with cooking spray. Serve these warm calzones with a mixed green salad to round out the meal. Omit mushrooms. Brown sausage with peppers; drain. Return to skillet. Add 1 pkg. (6 oz.) fresh baby spinach; cover. Cook 5 to 6 min. or until spinach is wilted. Add cream cheese spread, mozzarella and garlic powder; mix well. Continue as directed. 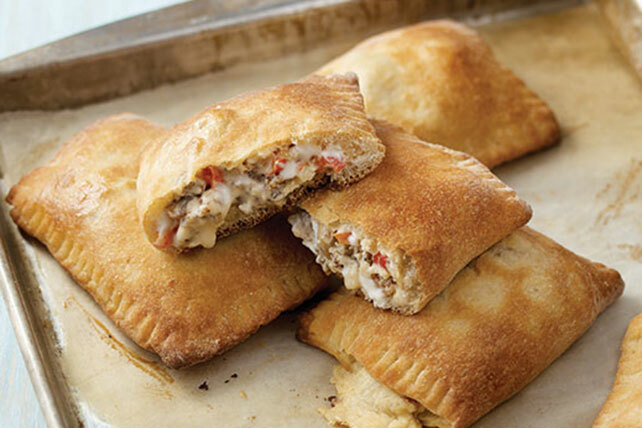 Sprinkle each calzone lightly with KRAFT Grated Parmesan Cheese before baking.